Looking to install a new sod lawn? You’ve come to the right place! Unlike seeding, sodding allows homeowners to achieve beautiful established lawns quickly, at any time during the growing season – as long as the ground isn’t frozen or covered with snow! But before you lay your first roll of day fresh sod, it’s crucial that you prepare your site and soil first – it can make the difference between success and failure in new lawn installation. 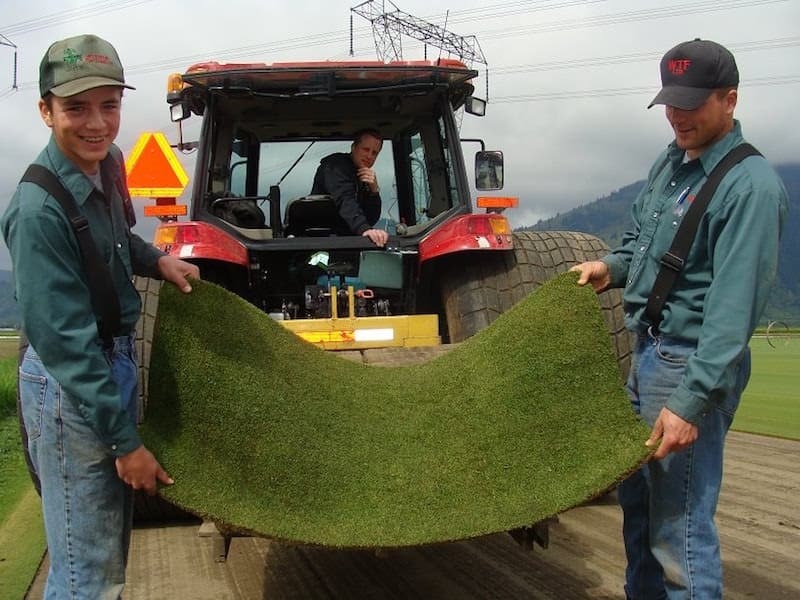 Here at Western Turf Farms we offer a wide range of different sod products. If you aren’t a lawn care pro the list may seem a little daunting, but don’t worry – we’re here to help! Start by considering the climate in the area where you live. Like all plants, different grasses are adapted to thrive in many varied types of growing conditions. We’ve developed a range of home and garden sod blends that thrive in the unique growing locations found throughout Western Canada. Are you installing a lawn in an area with heavy sun or shade? Will it naturally receive a lot of water throughout the year or is t in a drier situation? Knowing the conditions you’re working with is a great way to start narrowing down the list of sod options. Next, consider how you will use your lawn over the next several years. Do you need a space for kids and pets to romp? Or is your goal to create a more sophisticated showcase lawn? For homeowners looking to create a multi-functional backyard for family life, a relatively low maintenance and hard product may be the most practical choice. To get you started, here’s 4 of our favorite products for residential projects. Still feeling a little lost? Give us a call at 1-888-888-7072 to chat with one of our experts about which sod is best for your unique conditions! All of our sods are carefully cultivated with proper fertilization and care, creating weed and pesticide free sods that are safe for your family and pets. No matter which sod you choose, you’ll always get a high quality product delivered farm direct and day fresh! Soil is a lot more interesting than most people give it credit for. Healthy soils aren’t just dirt – they’re complex mixtures of rock, clay, minerals, organic matter (decaying plants), and pockets of both water and air, that support a rich biodiversity. Or to put it simply, soils are a really cool habitat that’s home to a lot of tiny but important microorganisms that play a big role in our environment! Over time, soils can become compacted from foot traffic and heavy rains, slowly degrading the quality of the soil, and by extension your lawn. After all, it’s hard for anything to survive in an environment with limited nutrients and air movement. Fortunately, the simple act of amending your existing soil with a quality topsoil and/or organic amendments can quickly turn your site around. Anytime you install a new lawn, it’s important to begin by removing any debris, existing turf, or weeds that are in the way. That way, your new lawn won’t have any competition for water or nutrients as it works to establish itself. Also, by removing existing weeds up front, you can significantly reduce the chance of developing weed problems in your new lawn down the road. Next, take a good look at the soil you have left. In a perfect world every homeowner would have a rich, loamy soil with great drainage, but for most of us that’s not the case. There are 3 basic reasons a homeowner would choose to lay down topsoil and/or add soil amendments before installing sod. Like any living plant, sod will need a few weeks to fully establish itself (send out new roots) after being installed. It’s always a good idea to lay down a layer of fertilizer to provide your new sod with easy access to nutrients right away, to encourage and support new root growth while reducing the risk of transplant shock. Hot tip: Whether you choose to loosen and mix your soil by hand or rototiller, always check with your local utility before you start to avoid accidents! How do I know if I’m getting quality topsoil? When turf and lawn care pros talk about good quality topsoil, they’re talking about a soil that has high organic content (decomposing plant matter) and little to no weed seeds. Topsoils can be purchased in 1 cubic yard bags or by the ton, depending on how much is needed for your project. Over the years, we’ve developed our own in-house recipe for maximum benefit, the ProSoil Turf Topping Soil Blend – available for purchase & delivery with your day fresh sod order! Over time, problem sots can develop throughout your yard, whether it’s a hole your mower keeps catching on, or a sunken area that stays wet long after the rest of the lawn has dried. All of these problems can easily be addressed during the soil preparation phase of installing a new lawn. Start by adding extra topsoil or compost in areas you’d like to raise. Remember, the mixing process has added a lot of extra air pockets into the soil, so expect to see a little settling over time and plan accordingly. If you’re looking to improve the structure or drainage of your lawn, it’s usually a good idea to add a bit of sand and organic matter in addition to your topsoil. The sand particles provide an additional level of structure, while organic matter enhances a soil’s ability to absorb and hold water during and after rainfall. This is especially beneficial during dry periods when lawns can rely on moisture retained in the soil structure to meet their water needs, meaning homeowners spend less time watering during droughts! In addition to our ProSoil Topsoil, we also carry Washed Sand and Mushroom Compost, available in 1 cubic yard bars and bulk. Give us a call at 1-888-888-7072 for pricing and delivery options! Once you’ve finished loosening and mixing (and adding to) your soil, take the time to smooth and level the site with a rake. If you’re installing around the home, aim to create a slight slope away from the house at about a 2-4% grade. This will go a long way towards moving soil away from the building and preventing future drainage problems. Hot tip: Higher use areas will require good drainage. Soggy lawns don’t handle traffic well! Once the soil is prepped, it’s time for new sod installation! We deliver our products farm direct and day fresh, so for best results plan on installing your sod the day its delivered and water it in thoroughly. This will reduce the risk of transplant shock. For the first few weeks your sod will require a lot of water to keep it hydrated while it establishes new roots. Looking for more information on soil or regular lawn maintenance?